Smittybilt Foldable Shovel is a military inspired Recovery Utility Tool (RUT). On the one hand, this compact shovel is very practical and on the other, rugged enough for the toughest jobs. First things first, let’s start with the edges. With two serrated edges, you can use it both for cutting and digging. The blade is made from carbon steel that ensures great levels of strength. When speaking of materials, we should mention that the blade is additionally heat treated and that the shovel has a nice fiber reinforced nylon handle. 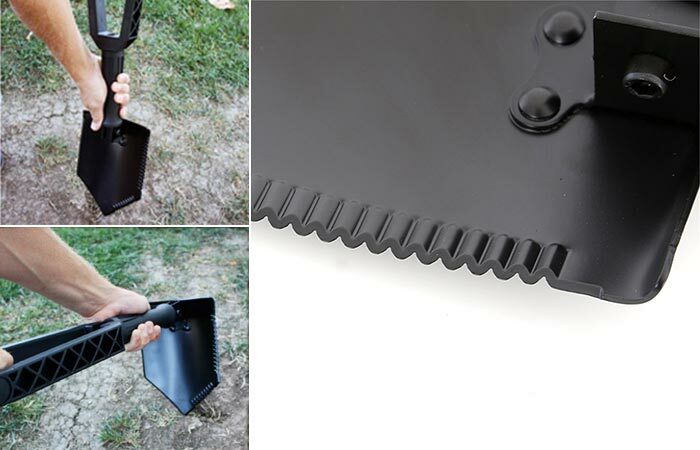 Smittybilt Foldable Shovel has two serrated edges and can be used for cutting or digging. Of course, the shovel wouldn’t be so compact if it weren’t for its tri-fold design. This way, you can easily store it, keep it in the truck for emergency situations or carry with you. It also features 2-way multi adjustments and a durable storage case. As for the dimensions, it’s 26 inches long when you open it and 9 inches when folded.